ENAR Ireland is a membership organisation. Our strength is in our Members: a national Network of diverse civil society groups committed to combating racism and all related forms of discrimination in every sphere of life in Ireland. We are dedicated to finding common strategies and policy positions for combating racism, for finding ways of complementing each other’s work, and for offering cross-community and cross-sectoral support and solidarity. As a network, we fully support Irish Travellers’ demand that the State recognises Travellers as an ethnic group. ENAR Ireland is a member of and is the Irish National Coordination for the European Network Against Racism (ENAR), based in Brussels. ENAR is an EU-wide network of NGOs in the EU Member States. ENAR combats racism, racial discrimination, xenophobia and related intolerance, and promotes equality of treatment between European Union citizens and all minority ethnic groups. 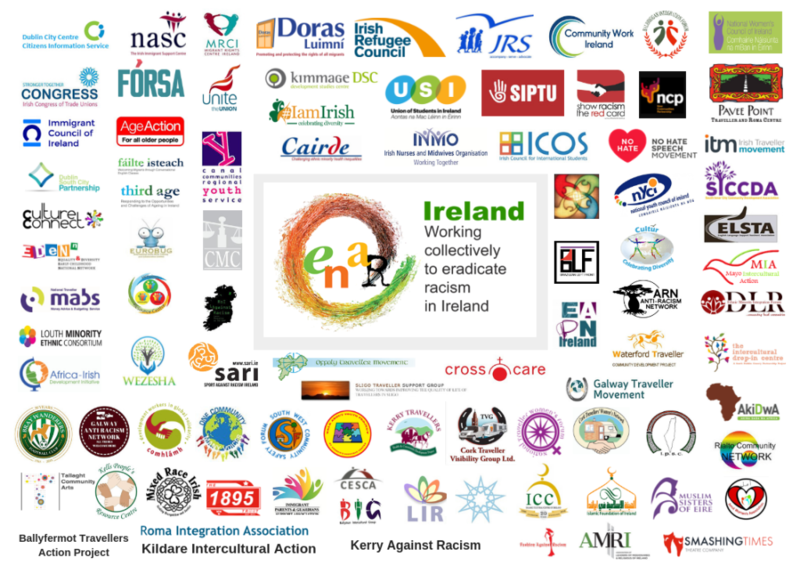 The membership of ENAR Ireland Network is FREE and open to all civil society groups and organisations committed to combating racism in Ireland. What we ask in return is that you sign our Membership Protocol and commit to working in solidarity with other members, send a representative to our monthly network meetings, contribute to and promote the network and its work, including iReport.ie, monitoring and combating racism, and supporting our call for a National Action Plan Against Racism. If you think membership is for your organisation, follow the steps below. Send both forms together with a high resolution logo (.jpg, .gif, .png formats only; no .pdf please) of your organisation to aga@enarireland.org. Meeting and exchanging information, ideas, and practices with other organisations committed to combating racism. Having the resources and solidarity of a Network, to support you in your work. Being able to promote your work through the Network. Learning new ways to respond to racism. Campaigning at a local, national and European level on issues relating to racism and discrimination. Helping shape policy and practices to combat racism in Ireland and Europe. Being part of a growing movement against racism in Ireland and Europe.